dry the water so the salad can be made more refreshing.Join your shopping cart now and what are you waiting for!!! Innovative design of human nature:Haolide Salad Spinner has a novel designappearance.It has a round handle,so the grip is very texture and comfort,it has a wide range of 360-degree rotation angle of a wide range of functions to make vegetables drying,More easy and labor-saving. Basket can be used searately as a colander.It is not only safe but also flexible. Release your hands:The Haolide Salad Spinner has a water inlet and a water outlet,all you just need to put the fruits and vegetables you want to wash in a container.That the lid and buckets fit closely,the container will be centrifugal high-speed rotation.Finally,pour out the dirty water and sundries from the water outlet to quickly get rid of your ingredients dry and fresh.This will prevent your hands from touching ice water. Multi-purpose water storage:Salad Spinner made of imported PS material,so the product is hard and wear-resistant transparent appearance can look directly at the amount of water,the amount of water can be controlled according to your preferences.It can store a lot of vegetables and water, this water can be used to water the flowers,thus you can savie water.It can also be used as a dish for making salads and for preserving ingredients. 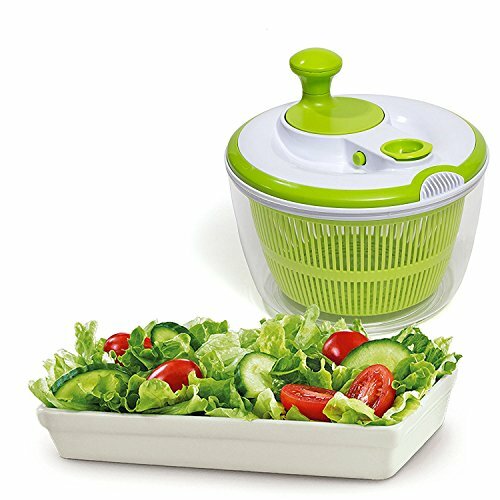 Retain delicious:Haolide Salad Spinner can quickly dehydrate vegetables to keep the food fresh and reduce the loss of fruits and vegetables water, so the dish is more delicious fried delicious.It has the ability to quickly dry the water so the salad can be made more refreshing. EASY TO CLEAN:The see-through design immediately signals whether there is leftover lettuce caught inside and it comes apart with a simple pull to wash thoroughly.all parts are made of food grade material,it is easy to clean, just rinse thoroughly with water and dishwasher safe. If you have any questions about this product by Haolide, contact us by completing and submitting the form below. If you are looking for a specif part number, please include it with your message.